If there is a vegetable that epitomizes summer, it has to be corn. Plump, golden yellow kernels, provide an all-too-brief reminder of how short the season is. The best corn is that which has just been picked, minutes before. For those of us who don’t live on a farm, some sacrifices have to be made. An average ear of corn provides approximately 1/2 cup corn kernels. Cobs can be frozen and reserved for corn stock — an indispensable pale golden elixir that has myriad uses, from sauces to risotto, to soufflés, chowders and gelato. The corn chowder in this post is adapted from Elise‘s version, viewable here, with some minor tweaks. Coarsely chop cherry tomatoes. Sprinkle with salt and pepper and set aside. Melt butter over medium-low heat. Add the onion, celery and celery leaves and sauté for 8 to 10 minutes, stirring frequently or until the vegetables soften. Be sure not to let the onions brown too much, as that will affect the color of the chowder. Break the corn cobs in half and add them to the saucepan. Add the buttermilk, whole milk and bay leaf. Bring to a boil and reduce heat to a bare simmer. Partially cover the pot and cook for 30 minutes. Make sure the heat is as low as can be and still maintain a gentle simmer to prevent scalding the milk on the bottom of the pan. Discard the cobs and the bay leaf. Raise the heat, add the potatoes and Jersey tomato to the pot. Taste for salt and pepper. Reduce heat and simmer for 15 minutes, or until the potatoes begin to break down. Increase heat to medium-high and add the corn kernels. Bring chowder to a boil, reduce the heat, and simmer for 5 minutes or until kernels are heated through. Taste for salt, if necessary; remove from heat. Let chowder cool slightly. Ladle 1/2 cup chowder into a blender or food processor and purée for one minute. Whisk purée into chowder. Stir, and set aside. Generously sprinkle salt and pepper on both sides of the fillet. Melt unsalted butter in a large sauté pan over medium-high heat. Sear the fish, skin side down, until golden brown. Turn over and place the pan in the oven and cook for 5 minutes, or until desired doneness is reached. Ladle chowder onto a shallow soup bowl or soup plate. Sprinkle with minced onion chives. Slice fillet in half and lay it in the center of the bowl, skin side down. 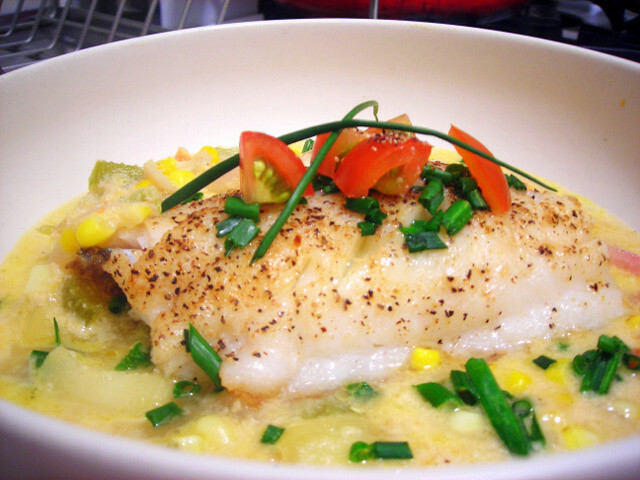 Spoon cherry tomatoes atop the fish, scatter with more onion chives, then serve at once. Time: About 90 minutes, including prep. 04 Jul	This entry was published on July 4, 2010 at 3:21 am. It’s filed under food, general, summer, Union Square Greenmarket and tagged buttermilk, chowder, cooking, corn, dinner, fish, potatoes, recipe, seasonal and local, slow food, soup, tomato. Bookmark the permalink. Follow any comments here with the RSS feed for this post. I agree. corn is the ulimate summer food. I will add blueberries, iced tea, ice cream cones, and BBQ. I just found a recipe for a cold grilled corn and blueberry salad — I’ll be trying it soon!